Flower flies are frequent flower visitors, hence the name. 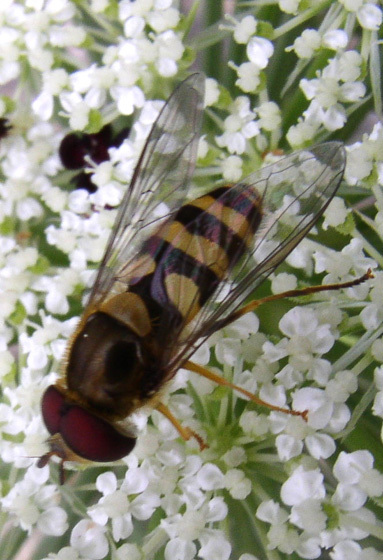 In England they are called hover flies, because of their behavior when visiting flowers. At first sight they are easily mistaken by bees. The main difference is that flies have only one pair of wings while bees have two pairs. Other differences are easier to see: the eyes, are much larger in flies than bees. The antennae of flies are very short and they have a thin bristle, called arista while bee’s antennae are longer and made of a series of segments. Fly legs are usually a lot thinner than those of bees. In general flies are less hairy than bees. 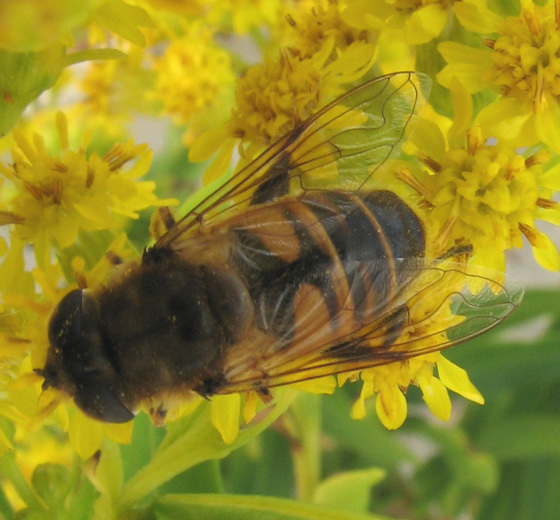 The drone fly is about the same size as a honey bee; it has yellow and brown markings. It is stout. Syrphini flies have a pattern similar to that of the drone fly but are more slender and a little smaller. There are several different species but they can only be told apart if captured and observed closely, preferably under a microscope. Some say that the drone fly is a bee mimic while the Syrphini flies imitate wasps. All these flies are very beneficial in the garden. The adults pollinate the flowers they visit and the larvae of some of them eat lots of aphids and other pests. Habitat. Fields and gardens, also cities, parks. Some species are often near aphid infestations because their larvae feed on aphids. Throughout North America. Season. From early spring to late fall. They are most abundant in the summer. Flowers. They prefer flat, open flowers, easy to reach. They visit many members of the daisy family or the aster family. Sometimes they bask on the sun on a leaf. 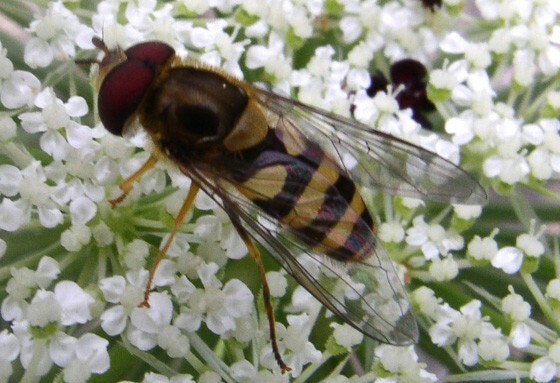 There are certain flies known as hover flies or flower flies that visit flowers frequently. They accomplish pollination; perhaps they are not as efficient as bees in general because they are rather hairless, so the pollen doesn’t stick to their bodies as much as it does to bees, and also because they don’t visit as many flowers. But they are so abundant that their sheer numbers make them more important as pollinators than one would think. Among them, there are a number that serve double duty in the garden. In addition to pollinating flowers, they lay their eggs in the proximity of aphids; their babies are voracious aphid eaters. There is one flower fly, Syrphus that is particularly good at this; there is no common name for this fly, perhaps because most people don’t notice them or confuse them with bees. 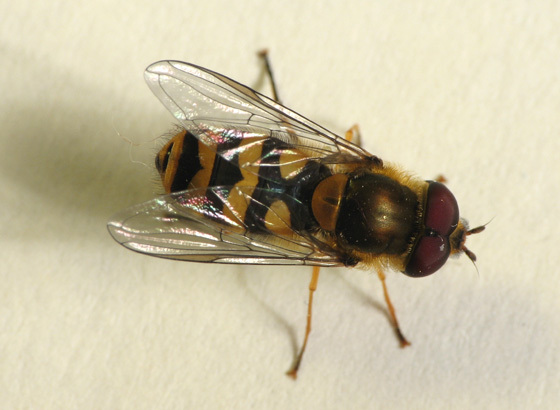 Syrphus flies, along with many of their relatives, masquerade as bees with a body that has yellow and dark brown stripes. They are smaller than honey bees, about the same size as many of the smaller native bees, such as some halictid or sweat bees. This mimicry serves them well, because hungry birds fear the sting of bees and mistakenly avoid these tasty flies. The imitation is so effective that many human observers get fooled too. If you observe them carefully, you will notice some differences from bees; first of all they have only two wings instead of four. But, more easily seen are their very large eyes, short antennae and thin legs. Like many other flying insects, Syrphus flies visit flowers in search of nectar to fuel their flight, and pollen, for their proteins. It is known that females need these extra proteins to make eggs. They are frequent visitors to a great variety of flowers, and since they have several generations each year, they continue visiting flowers through the seasons from early spring to late fall, switching from one type of bloom to another as flowers come and go. The other beneficial job that they perform in the garden is aphid control. Adults don’t have strong jaws to catch and kill an aphid but the larva or maggot does and is hungry for proteins to feed its rapidly growing body, so it goes for aphids with gusto. After mating, females search for aphid infestations; they are likely to overlook small gatherings of aphids in search for larger aggregations that would warrant a steady supply of food to their babies. The maggots are blind and legless but have no trouble finding prey to feed on. They grow rapidly on this diet; when fully grown and ready to pupate, they hide under a leaf or drop to the ground. They emerge as adults in less than two weeks. The new generation wastes no time finding flowers and pollinating them in the process. You are currently browsing the archives for the aphid control category.